Do you need a stamp for the office? In an office, stamps can be used to perform many different functions. You might need one with your company's address and contact details, your company's logo, with a certain phrase such as 'approved' or 'paid', or a stamp that will imprint the date for you. Here at Stamps4u we offer all of these types of stamps. You can easily create your own template for addresses and logos with our user-friendly software for one of our customisable text stamps. 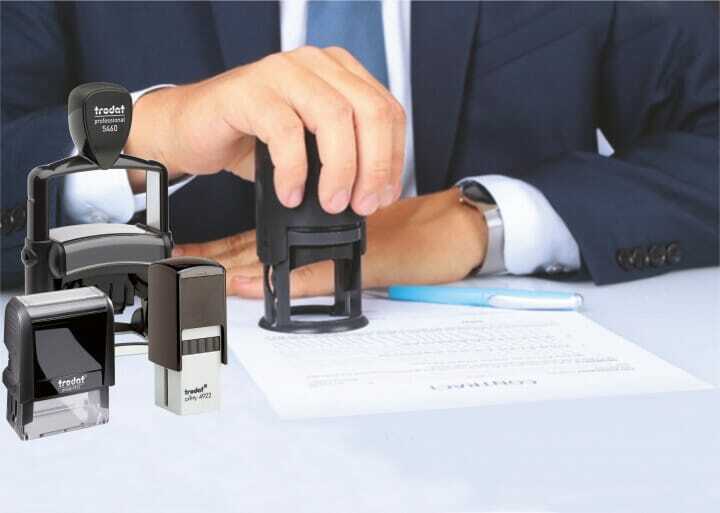 We'd recommend using a self-inking stamp, such as the Trodat Professional, Trodat Printy or Colop Printer. These stamps require no separate ink-pad as they have a built-in ink-pad and have the perfect size to be stored on a desk. Our standard word stamps for offices display words commonly used when doing paperwork such as 'paid', 'confidential', 'copy', 'draft', 'checked' and many more; also available are standard date stamps as well as stamps that display both a word and date. All of these stamps are also available as self-inking stamps or, in the case of standard word stamps as stackable pre-inked stamps. The pre-inked stamps are compact and come in a set of three words per stamp. Are you looking for a stamp for the warehouse? In that case we would recommend a heavy-duty, robust stamp such as the Trodat Professional 5212 or 54120. These are self-inking stamps, perfect for stamping single-handedly in one quick motion on packages or delivery notes. The stamps can be customised with any text such as 'Fragile' or 'This Way Up'. Some of the standard word stamps for offices will also be suitable in a warehouse where paperwork needs to be completed. You can for example choose between stamps that imprint 'received', 'first class', 'posted' and many more. Are you a teacher in need of stamps? Stamps are a great way to save time on marking homework or tests. With phrases such as 'excellent', 'well done', 'teacher assisted work', 'Learning Objective Achieved' and many more you can quickly mark your pupils' work and motivate them with colourful phrases to continue doing well. You can choose from our pre-set text stamps or customise a stamp with the phrases or images you'd like to use. The stamps are available as pre-inked or self-inking stamp, so no separate ink-pad will be required saving time and space when marking papers. Are you a healthcare professional looking for a stamp? Here at Stamps4u we understand how busy the work schedule can be for anyone working in the healthcare sector. To save you time when working on your paperwork, we offer a range of stamps that can be customised with your name and NMC or GMC number. You can choose between lightweight, portable stamps you can carry in your pocket with you, small stamps for your desk or pen stamps that serve a dual purpose as a pen and stamp. You can also customise these stamps to print your signature for quickly filling out forms. Do you need stamps for your printed loyalty cards? Are you in the process of putting a loyalty card scheme for your business in place? We can help you by supplying the perfect stamps to use with your loyalty cards. They are self-inking stamps, so you won't need to keep a separate ink-pad by the counter. They are also small and lightweight and wouldn't take up much space next to your cards. We have a few templates that you can use such as images of coffee beans, pizza slices, burgers, check marks and many more. Or you can design your own template to match your loyalty card.